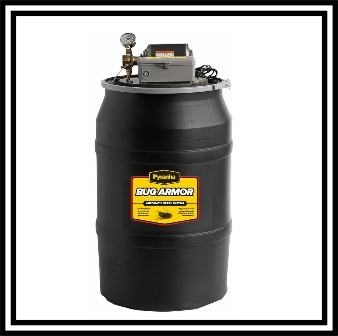 BugArmor means proven drum style automatic insect control systems that offer extremely reliable service. Straight-forward, simple operation to limit mechanical failure. The best of all worlds - automatic insect control designed for simplicity and longevity. BugArmor Systems are very versatile. They can be installed conveniently at the time of new construction, when additions are added or in already existing areas to effectively reduce insect populations. With over 40 years of manufacturing experience and tens of thousands of satisfied customers, our innovative designs, variety of options and effective control have clearly made the BugArmor System a leader in the industry. The normal automatic setting will give you carefree control of insects with no intervention. Insect populations can become extremely high from increased rainfall and heat. Rest assured that our digital timer with wireless remote control gives you the ability to activate an extra timed spray cycle when needed. The remote control is a great option when needed, but we take pride in our systems to control insects automatically.